This is the ultimate helping hands soldering station. 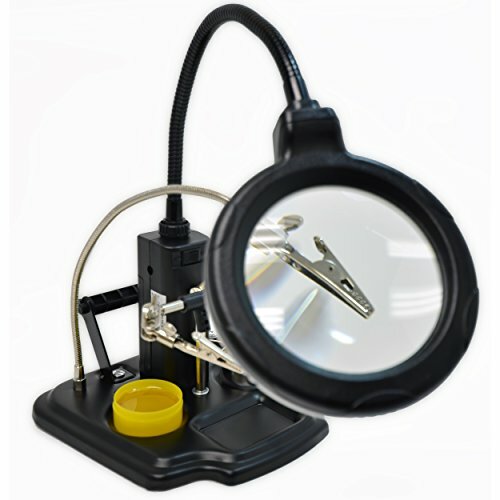 It comes with an illuminated, LED 90 mm glass magnifier on a flexible neck that gives you 3x magnification for finishing those fine solder joints. The 3 fully adjustable helping hands clips allow for precision positioning of you work. A sponge and brass tip cleaner are nested right in the sturdy, steel base and 2 brackets are included for solder spools. Don't worry about where to rest that hot soldering Iron, this unit has and soldering Iron rest built-in. If you have any questions about this product by Elenco, contact us by completing and submitting the form below. If you are looking for a specif part number, please include it with your message.